Around the globe, nations are creating marine protected areas (MPAs) that prohibit some or all fishing and other potentially harmful activities. MPAs can allow sensitive habitats and ecosystems to prosper in a natural state and can enable recovery of commercial, recreational, and subsistence fisheries, among other benefits. All too often, however, MPAs exist only on paper. These countries may lack strong legal authority to enable enforcement in their MPAs, further limiting their ability to detect and prosecute offenses. This is especially problematic for large-scale, remote MPAs that are typically located far offshore from the coastal state and face threats from illegal, unreported, and unregulated (IUU) fishing activities carried out by distant water fishing vessels flagged in far-away countries. 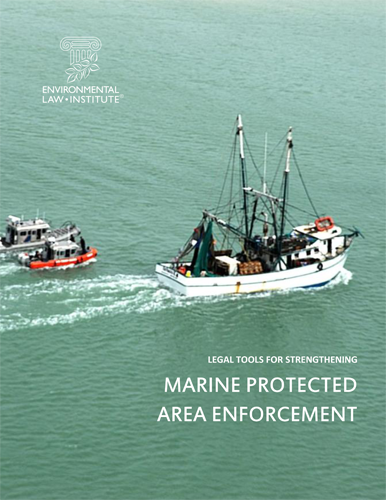 Legal Tools for Strengthening Marine Protected Area Enforcement: A Handbook is a new resource for countries seeking to improve enforcement for their existing MPAs or to write new MPA laws with an eye toward compliance and enforcement. Drawing on the input and experience of an expert advisory group, the Handbook introduces a set of principles for effective MPA enforcement to guide policymakers and legal drafters. 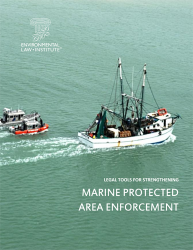 It then presents a variety of legal tools and approaches available to improve a country’s MPA enforcement and compliance, together with sample provisions that countries may use to implement these reforms through targeted national legislation, regulations, international agreements, or other legal instruments. Topics covered include the powers of enforcement officials, detection of offenses, adjudication, penalties, international collaboration, the role of local communities, and more.